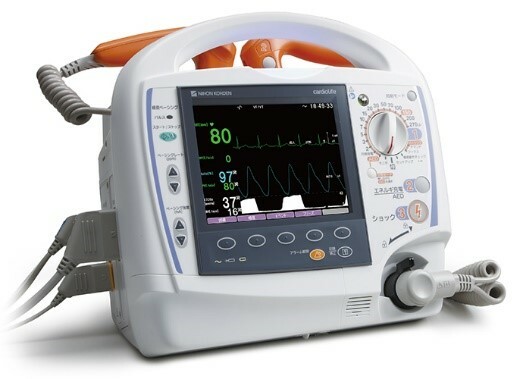 Designed for improving quality of resuscitation the TEC-5600 is a professional biphasic monitor/defibrillator supporting BLS and ALS teams in hospitals and clinics with its intuitive, fast and effective operation from early detection over resuscitation to post cardiac management. Innovative key technologies such as cap-ONE ETCO2 and ec1 arrhythmia analysis effectively improve the quality of resuscitation and patient monitoring throughout the process of saving life, restoring life and sustaining life. 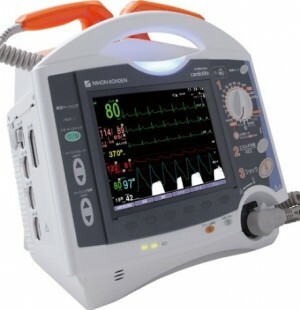 TEC-8300 defibrillators enable defibrillation using a low-energy biphasic impulse curve. Defibrillation with a biphasic impulse curve takes less energy than the usual monophasic defibrillation, causing less damage to the cardiac muscle. Biphasic technology gives you better results in keeping patients from sudden cardiac arrest. NIHON KOHDEN has used a special T circuit; this exclusive ActiBiphasic Technology* by NIHON KOHDEN improves on most conventional biphasic circuitry designs. In conventional biphasic circuits, when impedance is high, the pulse width becomes wider which reduces the efficiency of defibrillation. The NIHON KOHDEN T circuit actively controls the second phase pulse of the shock impulse, keeping a constant impulse curve. 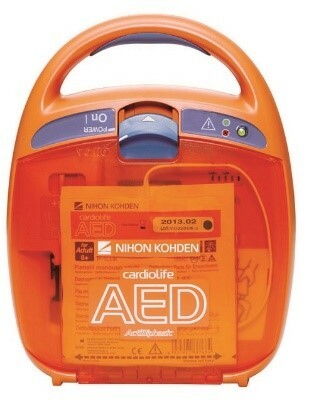 This unit supports AED (automatic extended defibrillation) using an adapter cable for optional disposable shock pads. As soon as the unit detects a defibrillated rhythm, the TEC-8300 will start to charge for hands-free defibrillation. A signal tone will sound to optimise resuscitation activity timing. There is also a voice prompt module optionally available for less experienced users. Optional extension module enables SpO2, CO2 and NIBP monitoring as additional parameters. Up to five traces can be shown at the same time on a brilliant TFT colour LCD display. Voice guidance is compliant with AHA guidelines 2010. Adult/child mode switch can reduce the energy for child use. 90 minutes rescue data can be saved and reviewed on a PC with viewer software. 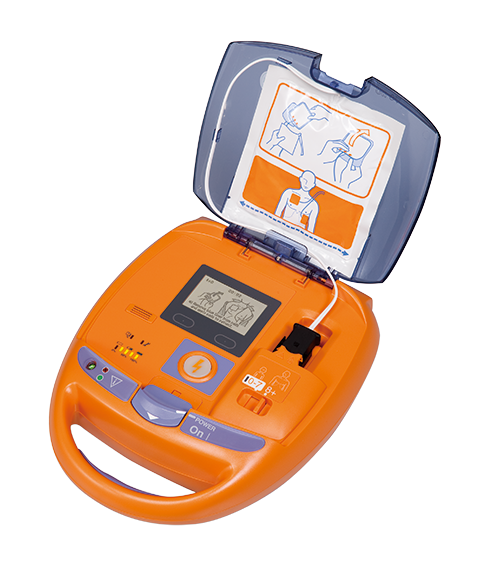 *AED mode – LCD display provides the untrained user with operation guidance and CPR instructions by illustrations and messages. * Semi-auto mode – LCD display shows the ECG waveform so trained medical staff can start analysis and decide when to shock.